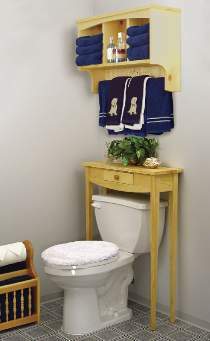 You can always use more storage space in the bathroom. These projects are both made from 3/4" stock. Wall shelf measures approximately 19"H x 28"W x 9"D. Table measures approximately 39"H x 28"W x 9"D. Birch knob for table drawer available separately. Order plans individually or save by ordering the Special which includes both plans.